Is Thursday Lucky for you -Play Powerball! Powerball is a lottery operated by New South Wales Lotteries in New South Wales and the Australian Capital Territory, Tattersalls in Victoria and Tasmania, Golden Casket in Queensland, the South Australia Lotteries Commission, and Lottery west in Western Australia. The first Australian Powerball draw was held on 23rd May 1996 and throughout the games’ history, the format of the game has only changed once. On 1st March 2013, new regulations were introduced in which players had to match more numbers from a smaller ball pool to secure the top prize. Earlier players had to match five numbers from 1 to 45 and one Powerball number from 1 to 45 to win the jackpot. The new format means that players must now match six numbers from 1 to 40 and one Powerball number from 1 to 20 to win the jackpot. The result of the new format means that the overall odds of winning a prize in the Australia Powerball have increased from 1 in 120 to 1 in 78. The format has resulted in bigger jackpots as once the top prize reaches AUD$10 million, a minimum of AUD$10 million is added to the jackpot prize pool with each rollover. The largest Powerball jackpot to date reached AUD$80 million after eight consecutive rollovers. The record-breaking prize was finally won on 30th July 2009 and shared between one ticket holder from Victoria and another from New South Wales. 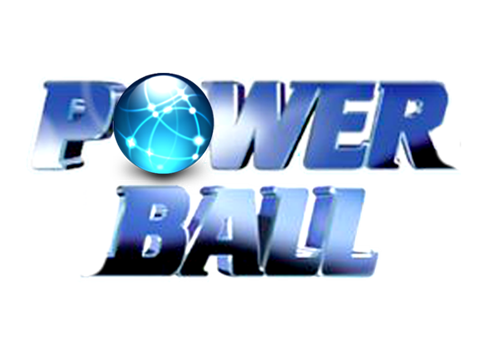 The Powerball draw is held every Thursday night at 8:30pm AEST (entries close at 7:00pm the same night). Six numbers are plucked from a pool of 40 balls, in addition to a seventh number – the Powerball – which is drawn from a separate barrel of 20 numbers. Since this special number is pulled independently from a separate pool, it can potentially be the same value as one of the first six. 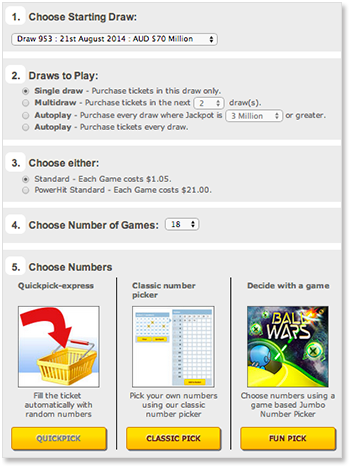 In Australian Powerball all players must first select six main numbers from a selection of 1 – 40 and then an additional Powerball number from a range of 1 – 20. To win the jackpot all seven numbers drawn (six main numbers plus the additional Powerball number) must be matched, however if players don’t quite managed to do that there are a number of other consolation prizes available to win. You can choose to select your own numbers one by one, or else opt for a Quick Pick whereby all your numbers are generated at random. The chances of winning at least the eighth division are 1 in 110. This compares favourably to other major lottery games in Australia – for instance, the lowest division in Saturday Lotto returns at 144 to 1. However, the nature of this format makes it very difficult to win the Division 1 prize; the odds of a single ticket hitting all seven numbers are nearly 1 in 77 million. The largest ever Powerball jackpot was hit in July 2009, when multiple winners split a total prize of AUD $80 million. You can play this lottery online regardless of where you are in the world, through the internet. You should be 18 + years of age and have to register to submit your ID documents as required. The Online Ticket Concierge service works by you selecting which numbers you want to play in this lottery and then your ticket with be purchased for you on your behalf in Australia. Once you have registered with the service you will be able to buy tickets for the Australian Powerball game and these will be available to view as a scanned copy within 24 hours of the completion of your purchase. Powerball games must be purchased four at a time, meaning a single ticket actually consists of four separate games. While players are permitted to buy tickets on an individual basis, there are many creative ways in which players can purchase multiple games or join groups that are buying more tickets. This is normal purchase, in which you may choose to pick your own numbers or have them randomly selected for you. A single standard game costs $1.05, and players may purchase as many tickets as they wish. This group play option allows you to buy a share – or several shares – in one or more Powerball lotto tickets. If any of these tickets ultimately wins, the prize money is distributed equally for each share. You can play anonymously with randomly generated Lotteries Syndicate games, or in a Social Syndicate with friends, family, co-workers, or whoever else you wish to be a stakeholder. This is a great way to partake in a large system without having to risk thousands of dollars every week. In a system play, you purchase tickets covering every possible combination of six numbers plus the Powerball, for a certain group of numbers. For instance, in a System 10 you will play the equivalent of 210 standard games, with each one covering a different sequence of the 10 numbers in your system. Prices start at just under $8 for a System 7, rising up to over $40,000 for a System 20 which equates to 38,760 standard games. This is a special type of system game which covers every possible Powerball, from 1 to 20. This ensures that you will hit the Powerball on one of your tickets, which means you only have to worry about matching at least two of the remaining five numbers to the correct Powerball value. PowerHit prices range from $21 (seven standard games) up to more than $19,000 (over 18,000 standard panels). This comes between a standard Powerball Quick Pick ticket and a system play. In a super combo, you will play many combinations of a set group of numbers, but not enough to cover every single combination. Like, the Super Combo 9A takes nine numbers and mixes them up in 30 different games, giving you many ways to win with those numbers. A Powerball Super Combo can cost anywhere between $30 and just over $500. Powerball tickets can be purchased over the Web online or at a retail outlet. You can choose from all the biggest national lottery brands, including Powerball, Oz Lotto, Lucky Lotteries, Super 66, and the Soccer Pools. You can also buy lotto tickets via mobile on iPhone, iPad, Android and BlackBerry devices, and most other smartphones and tablets. Whether you play mobile Powerball, or you prefer to purchase tickets on PC or Mac, all cash transactions made are completely safe. The sites use a state of the art 128-bit SSL (Secure Socket Layer) digital encryption to protect all your personal data, and supports only trusted AUD banking methods such as Visa, MasterCard, Diners Club International, PayPal, and BPay.